This red-breasted nuthatch has been frequenting a blue spruce in Westborough this fall. Named for its rusty red breast, it also has a dark stripe through its eye. It is smaller and slimmer than white-breasted nuthatches, which are common in our area. Males have a black cap, while females have a blue-gray cap. Fall can be a season of possibilities, especially when it comes to looking for birds. This year fall in Westborough might offer a glimpse of a red-breasted nuthatch, a little bird that won its fifteen minutes of fame last spring. 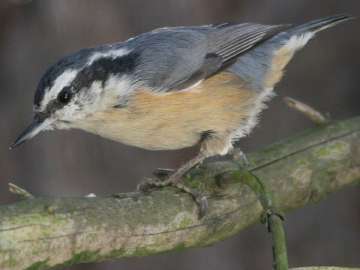 Last March red-breasted nuthatches (Sitta canadensis) made the national news – in science at least – when researchers discovered that these nuthatches could understand the details of alarm calls given by black-capped chickadees (Poecile atricapillus). 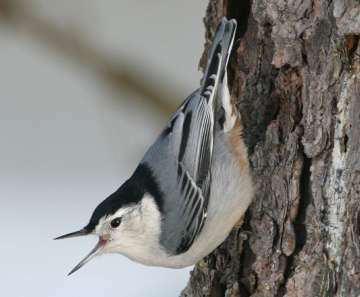 Not only did red-breasted nuthatches respond to chickadees’ alarm calls, but they also reacted most strongly to the chickadee code for the most dangerous predators. This strong reaction told researchers that the nuthatches recognized the code. For example, chickadees have one code for small predators, such as small owls and small hawks, which are nimble enough to catch little birds. They have a different code for larger creatures that are less likely to capture chickadees, such as large owls and humans. Red-breasted nuthatches understood the information about the size of predators, which is encoded in the number of “dee” sounds in the “chick-a-dee-dee-dee” call and in several other subtle variations in the call. What about our white-breasted nuthatches (Sitta carolinensis)? Can they too understand chickadee messages about the size of predators? We probably won’t find out until researchers extend their knowledge by doing similar studies with white-breasted nuthatches. In any case, red-breasted nuthatches do other smart things besides tapping into chickadee messages about nearby predators. Both red-breasted and white-breasted nuthatches are easy to spot when they walk headfirst down trees, as this white-breasted nuthatch is doing. White-breasted nuthatches have a white breast and an all-white face. Red-breasted nuthatches also have a unique way of protecting their nests from predators. In the spring, when they dig their nest holes in dead or rotten trees, red-breasted nuthatches smear sticky pine or spruce resin around the entrance, both outside and inside. They keep doing this for weeks, as long as the eggs or young are in the nest. And that’s not all. Red-breasted nuthatches usually bring resin to their nest hole by the beakful, but occasionally, they carry it on a piece of bark and then use the bark to apply it. This use of bark counts as an example of a bird using a tool – something that’s relatively rare. How do red-breasted nuthatches avoid getting stuck in their own sticky traps? They usually become good at diving through the nest hole without touching the resin. When the day comes for the young to leave the nest, the parents sometimes cover the sticky edge of the nest hole with bits of fur. We don’t often get to see these famously smart little birds in Westborough. They typically live year-round farther north, in the spruce and fir forests of New Hampshire, Vermont, Maine, and Canada. Red-breasted nuthatches usually don’t migrate, but they do sometimes show up in our area. What brings them down this way? The answer makes sense: lean years up north get them moving. As it turns out, every 2 to 4 years, the cone crop in northern forests is meager. Red-breasted nuthatches tend to move south for the winter in these years. Other northern birds may do so as well. A few red-breasted nuthatches may stay year-round and even nest in eastern Massachusetts. They may adapt to life among our white pines or white cedars. Is this a year that sends red-breasted nuthatches to Westborough? Watch for them at your feeder and among pine or spruce trees. Let us know if you see one by emailing NatureNotes@westboroughlandtrust.org. Toward the end of the winter season we’ll report on the results in this column.